It's the first week of spring! Though it is quite chilly in the southeast (hence my indoor photos) and the northeast has snow. Still, I'm excited because I can't wait to say goodbye to winter. I dislike cold weather (by the way anything under 59 degrees is cold - lol). I'm starting to sew for warmer temps in the hopes that 60s and 70s are in my weather forecast. But since that doesn't seem imminent I'm starting my spring sewing with this jumpsuit. 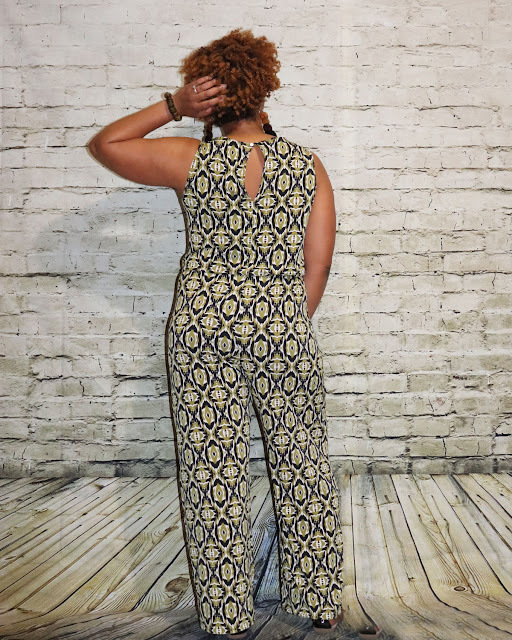 Jumpsuits can be a great transitional pieces, paired with a cardigan or blazer they can carry you from a chilly morning to a warm afternoon. 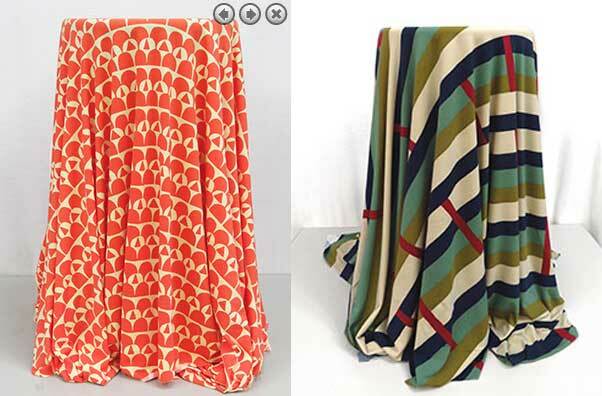 What comes first the fabric or the pattern? For me it can be either, but this time I was moved by the fabric. As soon as I saw this Green Aztec Print ITY I knew it had to be a jumpsuit or a maxi dress. 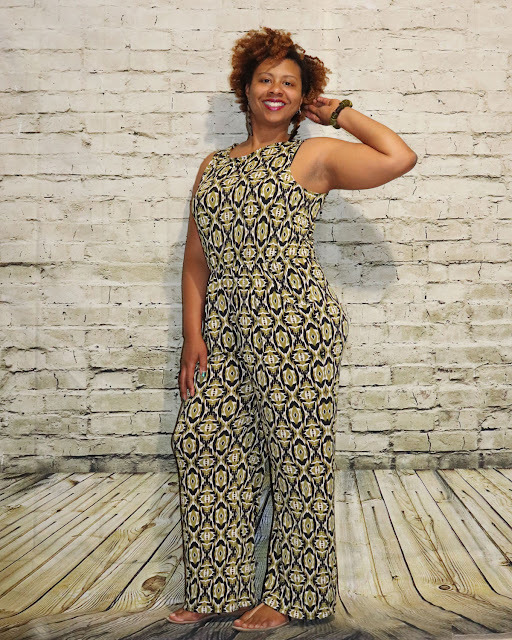 Obviously, I opted for a jumpsuit, Butterick 6630 to be exact. Mostly because I've had this pattern for a while and I haven't used it. I also love that it has pockets! The pattern sewed up easy, nothing tricky here. The majority of the sewing was done on my serger, although I did reinforce my crotch seam with my sewing machine and finish my pants hem with my coverstitch. I made my first thread chain loop. The only alteration I made was shortening the hem of the pants by 2 inches (and I still used a 1" hem double folded hem) and I'm 5'5". I'd always rather pants be drafted too long than too short, so that wasn't really an issue. 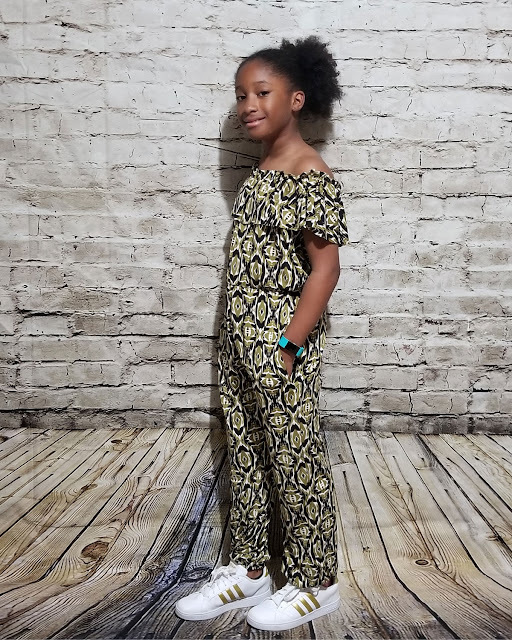 I had enough fabric left to make Miss Socialite (my stepdaughter) a jumpsuit too! She's pretty into the cold shoulder trend so I figured she'd like this off-the-shoulder look. She also really likes joggers soI knew the harem pant hem would be a hit. 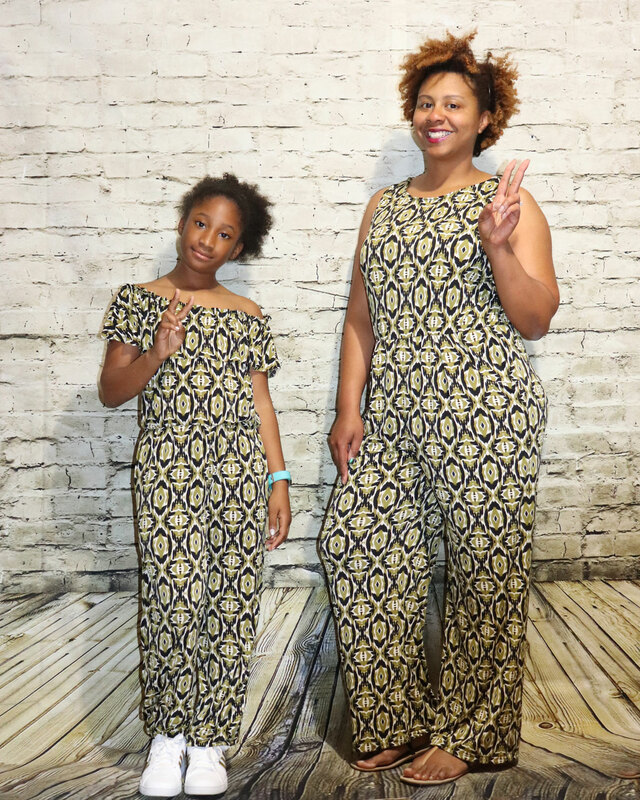 I used a tween pattern from New Look, NL6444, that also includes a romper and two dress views. I didn't love the instructions for adding the elastic to the ruffle so I just winged it. I won't share what I did because its a mess. As fast as she's growing I don't care to fix it, but I'll figure out a better approach if I sew it again. 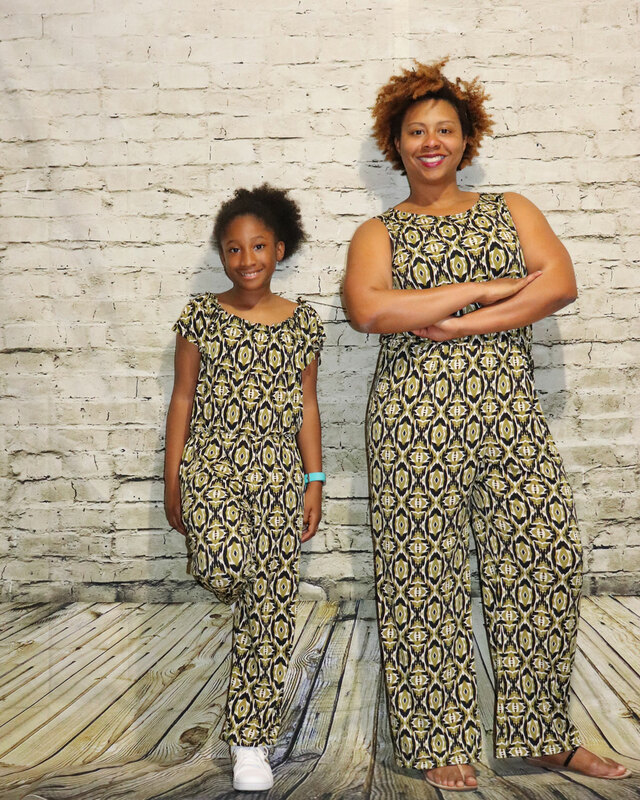 I also dislike that most kid and tween patterns do no include pockets, well at least not functional ones. So I added side seam pockets because the more she can carry the less I have to! 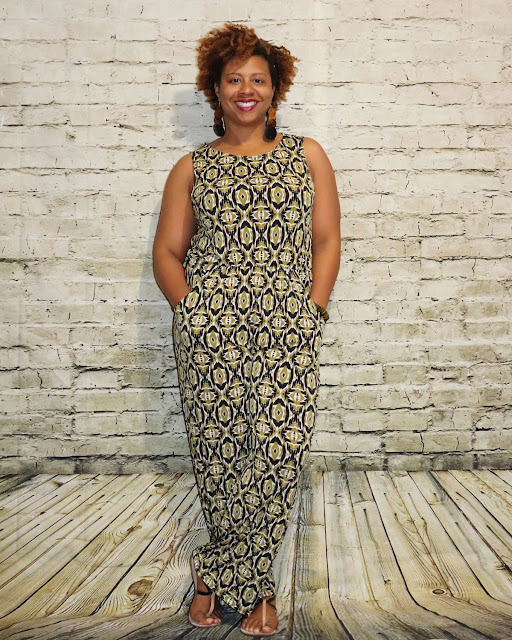 I think I will also sew the maxi dress from the Butterick 6330, since I already now that the bodice fits well. 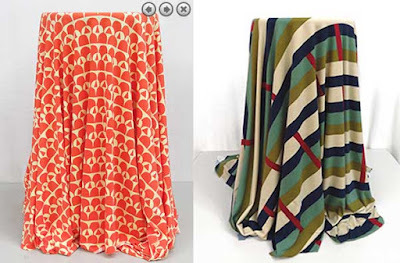 I'm already eyeing this Precut Mod Orange and Yellow ITY or this Precut Diagonal Striped ITY. Wouldn't these be fun? I am looking forward to sewing more spring and summer projects. How about you? i love jumpsuite this one is a hit it is pretty you did a good job!! I love these! Great fabric choice, and it looks like your fit is perfect! Great job on the jumpsuit. It looks good on you and fits so well. So sweet of you to sew on for your stepdaughter. You're both adorable.